View of frame with American Foul Brood. American Foul Brood (AFB) is caused by Paenibacillus (=Bacillus) larvae, a spore-forming bacterium. Bacillus is a genus of gram-positive, rod-snapped bacteria and a member of the phylum firmicutes. Bacillus species can be obligate aerobes (requiring oxygen). Bacillus and related endoscope forming bacteria. A spore is a specialized cell that is produced during sporulation by a bacteria facing starvation. The spore contains the bacterial DNA and has a hard outer shell that protects the cell from harsh environments. This is not a stress related disease, therefore can infect the strongest to the weakest colonies. There is NO KNOWN CURE to this disease. 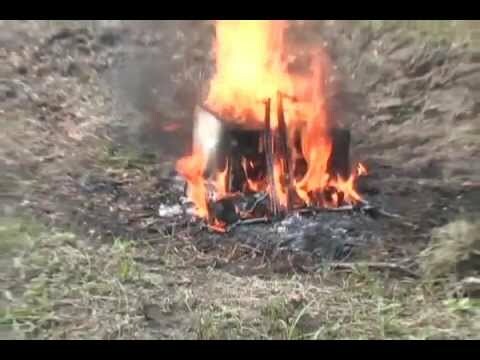 Destruction of infected colonies or irradiation of infected material is the ONLY way to manage AFB. AFB comes into the hive from nearby colony drifting bees, infected equipment/tools, beekeepers and robbing. The danger begins when the spores which evolved from the bacillus are introduced into the hive. The nurse bees transmit the spores to the larvae as they feed. 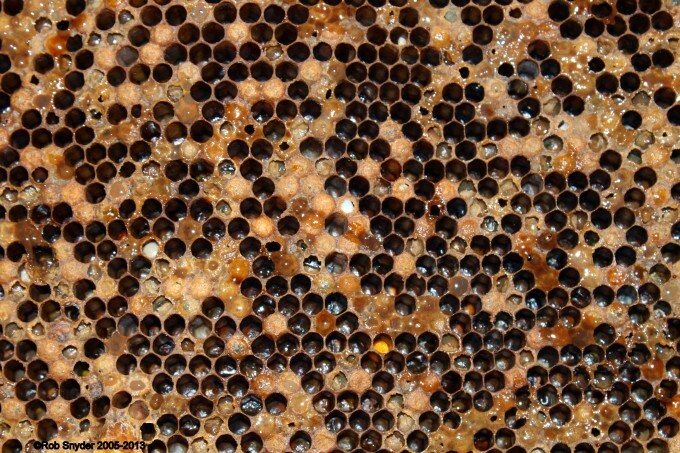 Upon arrivals in the midgut the bacterium, in its vegetative form, begins to nourish itself on the honey bee larva. AFB Larvae with Protruding Tongue. Death occurs, once the cells are sealed. A protruding tongue may be seen if death occurs in the pupal stage. 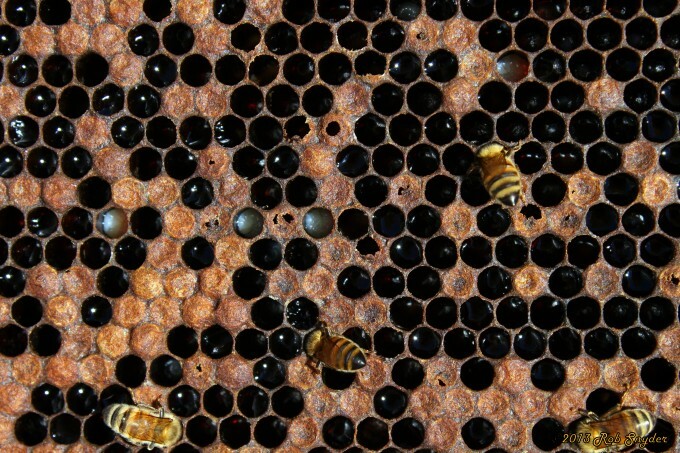 Cells may be punctured by worker bees who may eventually remove the larva. After the cell has been capped and the infected larva forms a cocoon it transforms from its typical pearly white color to a creamy brown, then gradually darkens. A classical symptom is when the larval remains can be drawn out into a brown thread or rope by inserting a toothpick int the cell and slowly pulling back. Initial symptoms may be observed when the capping of the diseased cell becomes moist and darkens in color. The larva begins to shrink which allows the capping to draw down into the cell changing the cell capping from convex to concave. 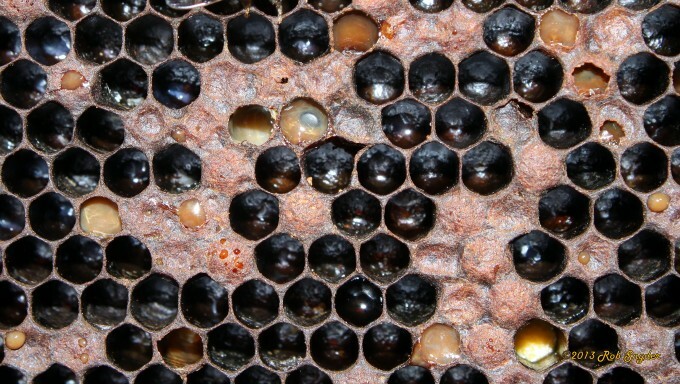 Spotty brood pattern, perforated sealed brood with coffee brown larvae inside, sunken sealed brood, coffee brown larvae sunken to the bottom of the cell. Moisture on sunken sealed brood, protruding pupal tongue (rare), and rotting smell (compared to rotting meat or sulfurous chicken house). Light to dark brown to black scale that is hard to remove. Often colonies next to infected colonies will show symptoms of the disease. Larvae rope at least 2 cm. House bees in their daily activity of cleaning out cells that contain dead larva, distribute the spores throughout the colony. 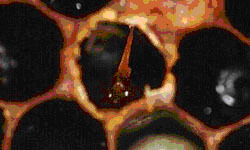 The honey stores in a colony also become infected with the spores. As the colony weakens from the disease, robber bees are able to get past the hives defenses, thus transmitting the AFB spores to their own colonies. The beekeeper may also facilitate the disease transmission by exposing contaminated honey to other colonies or by interchanging equipment which has been infected. The hive tool also becomes a means of transmission by spreading the spores throughout your apiary or into others as the beekeeper assists others in their inspections. Remember to sterilize your hive tools and other equipment with isopropyl alcohol or a bleach solution between yards or even colonies and to wash your bee suit after being around contaminated equipment. There is a diagnostic kit on the market (produced by Vita and sold in beekeeping supply stores) that allows users to collect and process samples of bee tissue, then analyze the mixture in a chamber that produces one line to show that the system is working and two lines if AFB is present. Samples may be sent to Beltsville Agricultural Research Center Bee Research Laboratory . Please review the instructions prior to sending any samples. USDA will not analyze samples (bees, wax comb, pollen, etc.) for the presence of viruses or pesticide residue. The AFB spores may remain dormant for at least 50 years on beeswax combs, used hives and components, honey, wax and propolis. The spores are extremely resistant to heat, direct sunlight, desiccation, fermentation, chemical disinfectants and veterinary drugs. Some geographic locations suggest the use of (oxytetracycline) Terramycin in the treatment of AFB. A diseased colony treated with drugs should be considered contaminated with spores forever and should be treated preventatively indefinitely. The Tetracycline prevents AFB spores from germinating to the vegetative stage and delays vegetative growth of bacteria in larvae. The treatment has no ability to penetrate or kill the virulent spores in contaminated equipment. A colony is not cleansed of AFB after treating for a year, two years or even five years. If a colony has had AFB and the drug treatment is discontinued the disease will often come back. Irradiation of equipment is a way to sterilize your contaminated or potentially contaminated equipment. There are companies that will treat pallets of beekeeping equipment – supers, frames, bottom boards, covers, honeycomb, etc. – with gamma irradiation to kill bacterial DNA. The procedure is safe and effective.